The USMRR Construction Corps deployed to Haymarket, Virginia today to assist in construction of Marty's McGuirk's CV Richford Branch RR. I loaded the Alkem Tiguan with a Festool track saw, Carvex jig saw, some Seneca parallel guides, power drill, and a shop vac. Again, I arrived without delay as traffic was light. Sunday work sessions might be the right formula for the 42 mile trek to Marty's house. The task for today was to complete the fascia on the layout front. This is the section of layout that will greet visitors that enter the basement from the interior stairs. Under the layout, Marty plans to have display shelves with lighting. So we needed to do a neat, trim job. However, Marty wanted the fascia panels to be removable. So that ruled out countersunk screws and mudded joints. Instead, we tried to get precise, square cuts so the joints would be imperceptible. Alas, Marty had 48 inch long sheets of ¼ inch MDF, so that necessitated more joints. We used the track saw to rip the sheets into strips. Working from the right hand side, we cut and installed the pieces one by one. We used Marty's nifty laser level to line things up. In some places we used small glue blocks to hold the edges in alignment. We'll see how these do with humidity changes. The upper edge of the fascia will be contoured to match planned some hills, but the main part of the layout here is a flat, level town. The fascia bottom had to dip down by the wall on the right side, as Marty originally planned a bridge in this area and so dropped the benchwork accordingly. He later decided to put a hill here instead. That meant that he needed to have a hole in the fascia to access a light switch. After discussing several options, we decided a hole with cover plate would be the best solution. We used the track saw plunge feature to cut a nice crisp hole. In fact, the edges of the hole were so sharp, we had to chamfer them with sandpaper to avoid scraping the inserted arm. Now that we have figured out the basics of how to do the fascia, hopefully the rest of the fascia will go up faster. Getting 8-ft sheets would help too. We got about 22 feet of the fascia installed today. I hosted Op session number 20 on the Aquia Line and number 25 on PoLA today. John Swanson ran PoLA solo, while Steve King, Herb Biegel, Bill Mims, and Jeff Mutter ran the Aquia Line. The op sessions went well. We started at 0900, so we ran trains 3, 4, 5, and 6 on the Aquia Line. The session ended about 1230, whereupon we walked to the Italian Restaurant around the corner for lunch. I think I like this paradigm of hosting a morning operating session rather than hosting the afternoon session, as it leaves a good part of the day open for other activities. The session went well and the crews did a good job. The Stanton throttles did not run out of battery. That tells me I have a bad USB hub or cable, vice worn-out batteries in the throttles. There was a problem left over from the last session that I chose not to fix, that was the broken switch stand for the double slip switch at Falmouth. That switch was one of the earliest I have built. I made the switch stand with laser cut acrylic and brass parts. After ten years, the acrylic housing just wore out, and then the brass rod snapped in my ham fisted attempt to quickly fix it. At first, I thought it would be simple matter to swap out the broken switch stand with one of my photo etched new versions. But, then I realized that it wouldn't be that simple. The repair would require my pulling the point rails and building new bridles, as well as re-gauging the switch. Since the switch was functional, as long as the brakeman/conductor help the points off center, I decided not to fix it. There is also another switch stand in this area that is close to failing. This is a Precision Scale cast brass harp-style stand. It also dates to the start of the layout. These issues have me seriously thinking about moving up the rebuild date on Falmouth. Why spend a good amount of time on repair, when I plan to relocate Falmouth as part of the expansion before the end of the year? At the same time, my wife and buddies are lobbying me to keep the full scope crew lounge. 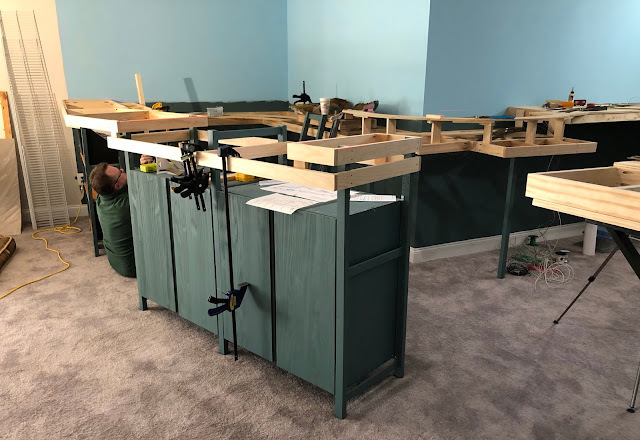 They argue it allows me to have space for my guests and grand kids (if and when they are born, I hope that happens before I am gone), allows me a space to set up a game table and also build modules and other projects as the mood fits. Their lobbying is working. I am now leaning that way too. This means an expansion that looks a lot like Plan 21, but it would add the bean pole trestle. So this is a new plan, 30b in the sequence of things. 30b provides a big space for the crew lounge without having to rebuild Aquia Landing. See track plan 30b below. Note, Plan 30B also has a slight addition at Burnsides wharf where I would trim the wharf and extend the water a bit to allow for a ship in the foreground. The ship would due reposition-able for op sessions. I drove deep into the confederacy today to help Marty McGuirk bring a slice of New England to the red clay foothills of the Blue Ridge. Marty is building a new layout based on the Richford Branch of the Central Vermont. The branch is way in the northern part of Vermont. It's practically in Canada. However, Marty now lives near Haymarket, VA, very close to several civil war battlefields, and about 45 miles from my house. Marty asked me to bring my track saw as the plan was to rip sheets of masonite for the fascia. So I dutifully packed my vehicle with a gaggle of Festools including the TS55 track saw, 70 inch track, Carvex jig saw, shop vac with cyclonic filter, and a cordless drill. Amazingly, I encountered light traffic all the way. When I arrived, Marty was having lunch with Stic Harris. Stic has been helping regularly Marty on building the new layout. They looked at me with silly grins and said, "We have a job for you." "What about the fascia," I asked. Marty relied, "Oh, I couldn't find any masonite. So instead, we need you to build the benchwork that connects the bridge scene to the rest of the layout. It has funny angles and requires math. At least more math than a Citadel history major and a ex-hockey player can manage." "Dang!" I said. "I just got a new tool that would be perfect for the job. It's a Festool Kapex miter saw with a special angle finder. Oh well, we'll muddle through." Finished bench work section, but where is Stic? 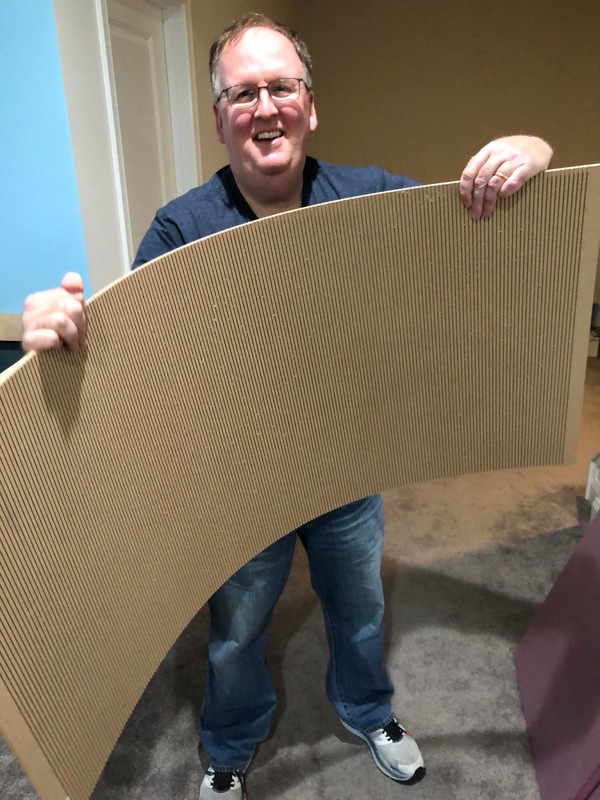 Marty shows off the kerfed MDF. Meanwhile, Marty showed us some kerfed MDF he got from Rocklers. It can curve to impossibly tight radii. It will be perfect for Marty's fascia. We plan to reconvene next Sunday to continue work on the benchwork. This time, Marty vows to have the fascia panels on hand. I drove down to Richmond today to participate in the inaugural ops session on Mike Pulaski's HO scale Mohawk and Hudson Layout, version 2.0. This is the first op session on Mike's new layout. He has been working on it for several years and has made a lot of progress. It is a double deck, point-to-point layout depicting a freelanced line in upstate New York that Mike calls the Mohawk and Hudson. The line features lots of through trains, locals and a paper mill job. The layout decks are connected by a large helix. Note the switch list omitted the destinations for the cars in the mill. I volunteered for the paper mill job and had a great time switching it. Mike is using a freeware switchlist generator that runs on his mobile phone. It caused a few glitches. For example, the switchlist for the mill did not describe where in the mill the cars were to be spotted. But overall, things worked very well. I enjoyed the mill job and the tracks well well thought out and there was plenty of room to run around the cars without getting on the main. The paper mill is a work-in-progress, but it is already an impressive scene on the layout. Mike does a lot of custom painting and his locomotives and cars are painted and weathered to a high standard. I posted a short video with some scenes from the day's activities. rebels advanced. There was no cover for several thousand yards. After the op session, I visited the Malvern Hill Civil War battlefield site. This was the scene of a bloody tactical defeat of the Confederate army under Robert E Lee. The rebels assaulted the Union Army of the Potomac on a narrow plateau of about 900 yards wide and several thousands yards long. The plateau stood between two rugged ravines and swamps. The Union had arranged their artillery here in a dense concentration and it slaughtered the rebels as they advanced. One Union artillery battery fired over 1200 rounds. I have a much better appreciation of the terrain having walked a large loop around the battlefield. It's hard to imagine why Lee thought this attack would work. It was a killing ground. Nevertheless, Union General McCellan was convinced he was outnumbered and decided to stay in this position, essentially trapped against the James River. He eventually withdrew via ship to Alexandria in time for the Second Battle of Bull Run. A view of the rough terrain bordering the west slope of the plateau. It was probably not as heavily wooded back then, but the slope and swamps are the same. Last Tuesday I hosted a wargame session in my basement for my friends. It was a fun experience and has me thinking about its implications for my layout redesign and expansion. About the game. I constructed a temporary 4 by 6 feet table in my crew lounge using some sheet foam, 1x2's and my portable saw horses. This size table fit comfortably in my crew lounge area. I set up a terrain board using a large piece of velour fabric. Under the fabric was the 2 inch foam board. I had 2 sheets of 2 inch thick 2'x8' foam on hand, so I used the left over pieces to create a ridge line on one side of the board. 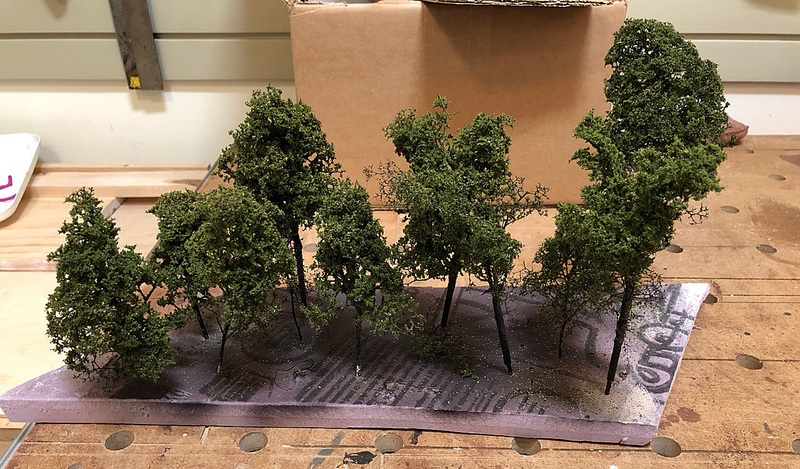 I added lots of trees from Scenic Express and Woodland Scenics. I made some hedges using furnace filters and flocking. For a road, I applied two wide strips of masking tape to the fabric. Then I airbrushed the road with acrylics. Wargame scenery is different from model railroad scenery in that it must be robust to survive rough handling and has to be reconfigurable to portray different scenarios. I had some brick buildings on hand that I could use. These were a result of doing some R&D to make brick buildings for a client. (I'll post more abut that later once I have results). The key to wargame buildings is that the roofs have to removable. I converted one building to rubble, which was a lot of fun to model. Overall the board took about a day or so to construct and initially add scenery. Then I took another afternoon to add some additional details. I used mostly ready made scenery items such as plowed fields, grass sheets, etc. To enhance the look, I sprayed some adhesive on the cloth and sprinkled ground foam. This isn't permanently secured. Once the board is taken down, I can gather the loose ground foam and reuse it. This is an idea I borrowed from my late friend, John Hill. He was a master at making nice, temporary war game terrain boards. Building the board was a lots of fun. My wife said it was very nice when she came to check on me to make sure I was still alive in the basement. BTW she won't let me have a refrigerator in the basement because she says, "then I'll never see you." John Drye and Mark Franke came over to play the scenario using the popular Bolt Action wargame. 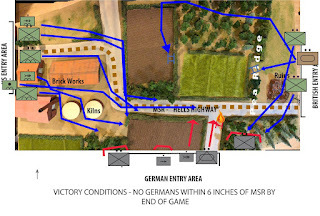 The scenario was a depiction of Kampfgruppe Huber's attempt to cut the main supply route during Operation Market Garden that I had researched and developed. 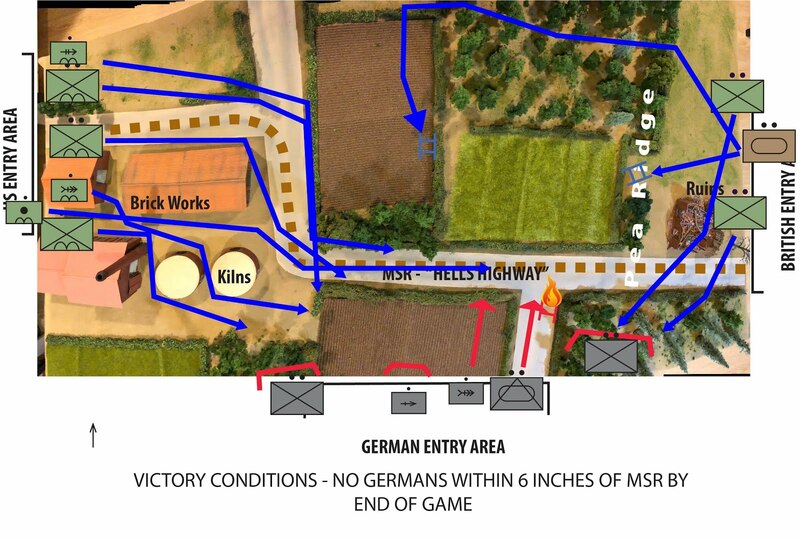 (NB, designing a wargame scenario is a lot like designing a model railroad layout. You take prototype information and apply it in condensed form to your available area. I am personally more interested in the simulation aspect than the competitive aspects of the game.) John lead the Germans, while Mark had a small British combined arms team of Sherman tanks and infantry counterattacking from the south, and I lead a reinforced platoon of US airborne soldiers from the north, reliving my days as a cadet lieutenant in the 307th Engineer Battalion of the 82nd Airborne. John was able to cut the road for about two hours (6 game turns) before the counterattacks pushed him back. He was heavily outnumbered, but he had two very powerful Jadgpanzer Assault guns as his main offensive force. 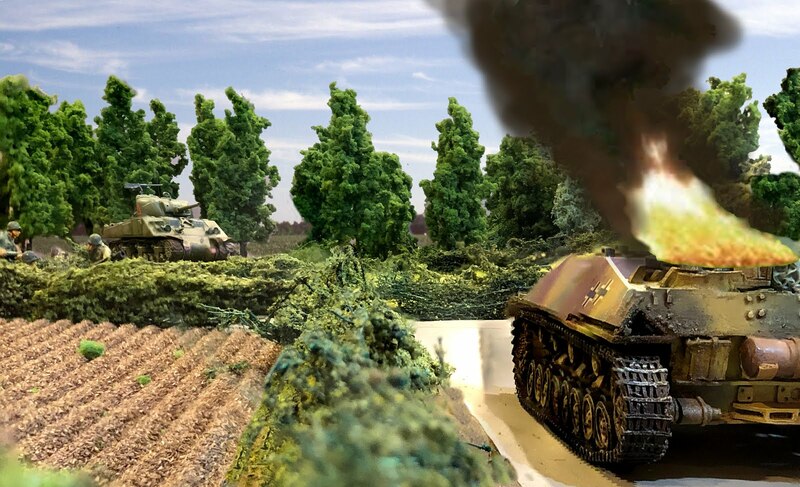 Unfortunately, they did not perform well and Mark's Shermans and bazookas drove them off while destroying one assault gun, and taking no loses on their own, though one of Mark's infantry squads ran off after a failed assault in the woods. As for my part in the battle, the main action was far from my platoon, so I spent most of the game getting PT as the paratroops ran across the board. We arrived just in time to mop up the remnants of the German infantry and to take some bazooka shots at the German armor. Overall it was a fun experience. I enjoyed making the terrain board. Since the Aquia Line is winter season, it was fun to make some green terrain again. So, this raises some questions about how to expand the Aquia Line. Should I keep the crew lounge open so that I can host more games like this? Alicia is definitely in favor of this. Or go all in with the expanded Aquia Line? Kinda of where I want to go. When I mentioned this to John, who also has a model railroad layout and likes to wargame. He said words to the effect that, "I can use my dining room for gaming, but I don't have political constraints imposed by a wife." I suppose I could use my dining room too, as long as it was very temporary. There is also the option of using my garage for occasional games. Perhaps the phased approach to expanding the Aquia Line is the best. 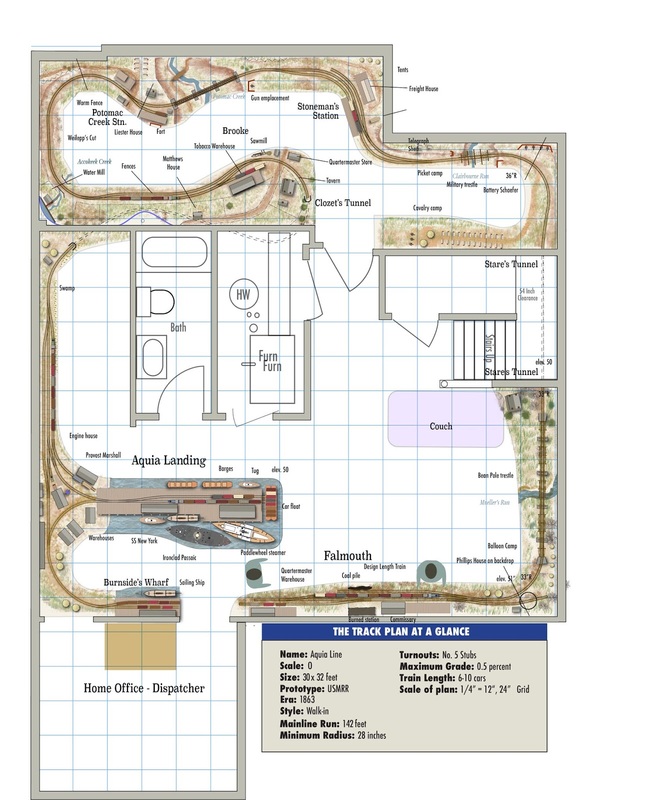 Replace PoLA with O scale layout in the same footprint as the former PoLA, then fill the crew lounge in a later expansion. In the meantime, I get to host one more wargame before I have to strike the terrain board to get ready for an April 6th Op session on PoLA and the Aquia Line. When I left Virginia on Friday the air was warm, the birds were chirping, the grass was greening, and the magnolia trees, cherry trees, and daffodils were blooming. So it was a bit of a shock when I headed west to Greensburg, PA for the RPM East and was greeted by freezing temperatures and blowing snow squalls as I crossed the Allegheny ridges. I made it safe and sound to the meet and even made a stop at my favorite hobby shop, Mainline Hobbies Supply in Blue Ridge Summit, PA, to stock up on scratch building supplies. The RPM East is an annual event that alternates locations on each side of Pennsylvania. This year, it was the western folks' turn to host and they did a fabulous job. I arrived Friday evening in time to catch a few clinics and set up some models to display. The model display was not that extensive, but I did see some nice work. Two highlights for me were a diorama of a barn in an recently harvested corn field and a heavily weathered SP locomotive. On closer examination, you could see that the barn was actually made from two box cars covered with a shed. The builder, whose name escaped me, had extensive prototype photos to document the unusual structure. I am a sucker for weathered SP locos, and this one by John Albert, was very well executed. He also had one of the new Scale Trains Tunnel Motors on display. Wow, that was a gorgeous model. They are back in stock too now. It seriously has me thinking about DRGW again. What can save me? I did a talk on Saturday evening to a small crowd of folks about my Aquia Line RR. They seemed to enjoy the talk. In the dealer area, I managed to get some brick chimneys from Randy Broadwater and a T shirt from the Steel City Chapter of the Railway & Locomotive Historical Society Kevin Varrato and Domenic "DJ" Arlia were there to represent the Society. They both are/were locomotive engineers (Kevin was with the Union RR and DJ is still active with CSX.) Kevin helped clarify some questions I had on how the slabs from a continuous caster were switched by the Union RR. DJ has a YouTube channel and website. Speaking of steel mill modelers, Chuck Pravlik and Brandon Wehe were also there with lots of cool steel mill model stuff for sale. We were near Pittsburgh the Steel City after all, even if most of the steel mills are now gone. This gets me thinking about steel mill modeling agains. Hmmm, tunnel motors and steel mills. Can you say DRGW switching Geneva Steel in Utah? I enjoyed the clinics I attended. Roy Ward talked about the 41st Anniversary of his layout. The next day when I visited his layout, I told him I would have to live to 93 to be able to catch up with him. His layout is very nicely done. He has a small layout room, but managed to design an impressive layout by sticking to 24 inch minimum radius curves. The Cheat Junction scene was the main inspiration for his layout and he did a great job capturing it in model form (see lead photo). Next, I visited James Pinkney's Western Maryland Tide and East Sub Rail. This was a treat as the WM Tide sub was the first railroad I planned to model before Matt Schaefer got me hooked on the C&O. James is from Britain and works for Bombardier, but is a huge WM fan. He has a neat representation of Port Covington and Sparrow Point Steel on his 900 square foot, multiple-deck layout. Don Coulter by the main yard of his railroad. I also visited Ken Hanawalt's Turtle Creek RR and Don Coulter's freelanced Pittsburgh Southern. Ken is doing great work with 3D printing for his layout. Don has about 75 percent of the track and benchwork for his freelanced modern NS layout done. It will be an impressive double deck RR when it is complete. Tables for drying the wet ground foam. The highlight of the weekend was a stop at Scenic Express's factory and warehouse, where Jim Elster, the owner, gave me a tour of the facility. So this is where the magic happens! 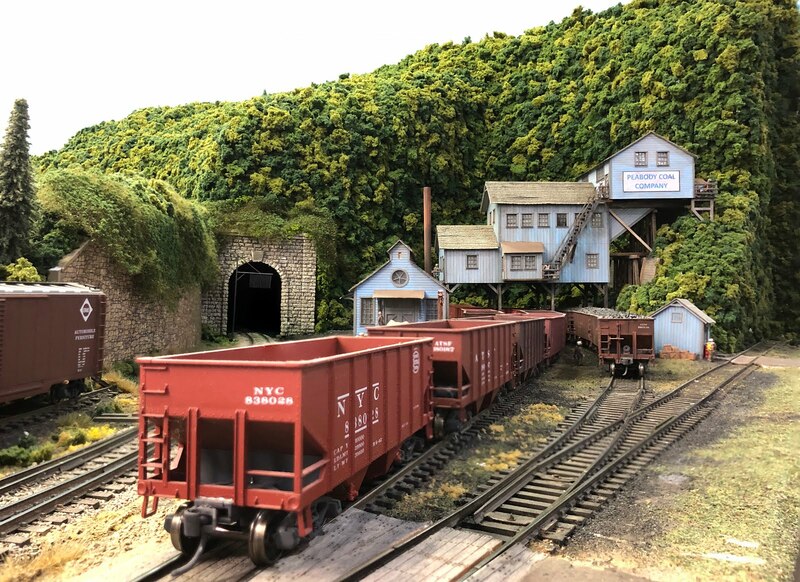 Jim is one of the most creative guys in the field of model railroad scenery. He also has relationships with other leading scenery manufacturers such as Silfor and Martin Welberg. Jim is a great supporter of the hobby and it was awe-inspiring to see the amazing array of products that he offers. Of course I stocked up of scenery supplies too. File that in the "It's a Small World Department"
We had three visitors to the Aquia Line tonight. My brother, Rob, and some of his coworkers, Chris Holden and David Amorosa joined my mom, Alicia, and I for dinner. Chris and David are former military service members. Chris served in the 101st Airborne and it turns out we had mutual friends in that outfit. David was a naval enlisted man who later was involved in construction of the US Embassy in Iraq. In the course of the evening they learned that Chris, David, and Alicia all were in Iraq at more or less the same time. After a nice dinner we retired to the man cave to check out the Aquia Line. Chris, though a Yankee, is a student and admirer of Stonewall Jackson. David builds plank on frame ship models. So we had a grand time running trains on the Aquia Line and talking history and modelling. We hosted Op Session 19 on the Aquia Line and 24 on PoLA today. Brad Trencamp ran PoLA, while John Salmons, John Stralka, John Barry (yes, three Johns again), and Mike Spoor ran the Aquia Line. The session went well, but we had a few glitches. Interestingly, this is perhaps the first time I have hosted a session when the majority of the crew was under 40. The crews did a good job with their tasks. Bryce, I mean, Brad, did a great job running PoLA on his own. He even fixed a dragging coupler on one of the cars during the session. The Johns, Barry and Straka, decided to push a car from from Brooke to Potomac Creek to switch the facing point turnout there. I don't think anyone else tried that before. However, the second crew did the same later, so perhaps this will become routine. We had the crews verbally OS as we did last session. That worked well, but it will be nice to get the telegraph in operation. In winter time the wood in my layout contracts as the humidity drops and some of the switches get tight. Yes, even after 10 years this still happens. The 3-way stub in Falmouth needed some adjustments to get it to work properly. But even after making some adjustments, the switch stand would not lock, it just wore out. This switch stand uses acrylic plastic and brass parts. It is one of the first ones I made with laser cut plastic. I will have to replace it with a stainless steel switch stand. Also, for the second op session in a row, the batteries on the Stanton throttles did not hold a full charge. I am referring to the batteries in the throttles, not the batteries on board the locos. I may have a faulty USB charger, or the batteries are old. However, the CVP T5000 throttle works great. I plan to get a second T5000 and retire the Stanton throttles. The T5000s are much simpler to use, especially the function keys, and the seem to have better radio transmission range. They also have replaceable batteries, so if they batteries go dead in a session, they can be swapped out. After the session, we looked at the two possible expansion plans, the Fredericksburg Extension and 28D. The group consensus was that 28D would be the better approach. Switching the harbor would be simpler without the wye peninsula, which would make things easier on the locomotive engineers as they can follow their engine better. The wye is really an inefficient use of the space. Several of my guests also said that they thought the wharf against the wall would make a more impressive scene than as the peninsula it is now. During the session, Alicia made delicious caramel brownies. My mom made a great pasta sauce, including a big pot of meatballs for dinner afterwards. John Barry and Mike Spoor stayed for dinner. John regaled us with stories of his increasing cattle herd. He is becoming quite the cattle rancher. Last night John Socha-Leialoha visited. John is a brilliant engineer who currently works for Microsoft. However, he also is involved in numerous other projects as you will see if you keep reading. I first met John years ago while on a trip to the Tacoma area. Back then, John was helping Mark Bridgewater build a large N Scale layout. I liked Mark's layout when I visited, but I liked his Cobra 427 replica even more. IIRC they were developing the Bluepoint switch machine back then. If you use Bluepoints, then you have used one of John's ideas. 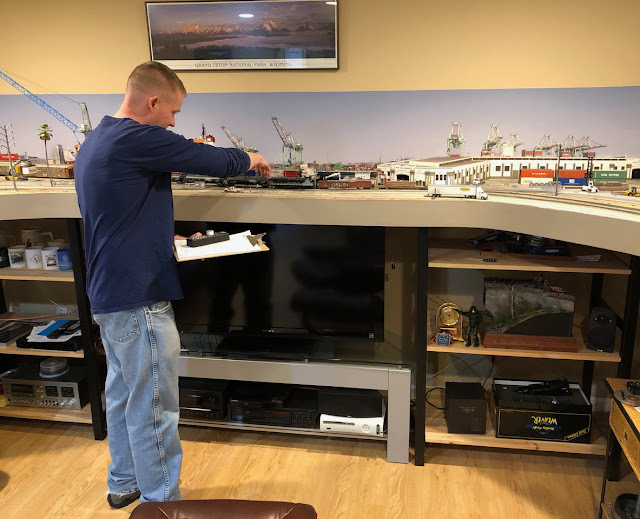 Mark has since moved to the Atlanta area and John has transitioned to being a tool junkie that supports model railroads. John is notionally modeling the RGS in HOn3, but what he really enjoys is building stuff for the model railroad hobby. And he has a serious set of tools to do that in his shop. The hobby is a big tent! Interestingly, John's first comment on seeing the layout, was "Nice crew lounge." Too bad I plan to make it much smaller. When I asked John if he wanted to run some trains he said, "no thanks. I could care less about operations." What he did show me was a new Wi-fi throttle that he is developing along with two other engineers for TCS, the DCC company. You can learn more about the throttle here. John went on to explain how he likes TCS decoders because of their high fidelity sound. Now it was my turn, I said to John, without rancor, "I could care less about having correct sound in my engines if it means more complexity. To me diesel sound is just industrial noise." I referred him to my now classic DCC rant previous posted on this blog. I love complaining about DCC. The throttle did have a nice feel to it. John designed and produced the throttle case with 3D printed plastic. The plastic had a slight grain that made it non-slip. The wi-fi throttle uses JMRI and a wifi net. Unfortunately, I was not set-up to run it, even though I do have JMRI. For now, I'll stick with my EasyDCC system. Next John gave me a short demo/tutorial on using Fusion 360 to make 3D drawings of parts. Learning 3D drafting is on my bucket list, so it is a skill I want to learn. The demo blew me away! John was able to draw quickly some parts, in this case a wagon wheel. I need to budget some time to get that program and learn it. It is free if your business makes less than $100K a year! Great for a cottage business like mine. John also showed me some of the videos he did using injection molding machines. He was a CNC router that he can use to make aluminum molds. He has two injection molding machines, so he can make styrene parts. It goes on, he also has tools to rapid prototype printed circuit boards, including some machines, such as a pick and place machine, that he built himself. I now have some serious tool envy! We really need to convince John to move to the DC area. To follow more of John's work see his blog https://trains.socha.com and his youtube channel. Scene from a Johnny Reb game depicting Gettysburg with some photoshop smoke. I was feeling under the weather this week, and my mom was ill too, so I did not get much modeling done. However, on Friday, my buddies JD Drye and Mark Franke, invited me to participate in miniature war-game depicting combat in France in 1944. I decided to accept their gracious invite, especially since some of the models we would use were painted and detailed by JD and Mark, both experts in that hobby. I used to do a lot of war-gaming, both in miniature, and board games, and some computer games before taking up model railroading. Since I was primarily a Mac OS user, the selection of decent computer war-games was slim, so I didn't partake much. But I did a lot of miniature gaming, particularly with John Hill and his Johnny Reb system. 57mm anti-tank shot that destroyed the sole armor support he had in the scenario. As I got more into model railroading, I let my gaming interest wane. In fact, in the past 20 years, I had played just one miniature wargame. There were several reasons for that. First, model railroading is a great, multi-faceted hobby that can be very time consuming. If you want to get a layout done, you have to stay focused. That might sound odd from me, as I dabble in lots of things, but the Aquia Line has been a steady current though all the conflicting tides of disparate projects, museum models and other diversions. The second reason is that wargaming can be competitive. Life is tough enough without more competition. On the other hand, model railroading is cooperative. I like that aspect of the hobby. It's one of the reasons I am not a fan of model railroad contests, though I do occasionally partake them. Afterwards, I usually ask myself, why did I do that? About a few years will transpire and I will go through the same cycle. Doh! Model railroaders is also a very social hobby. 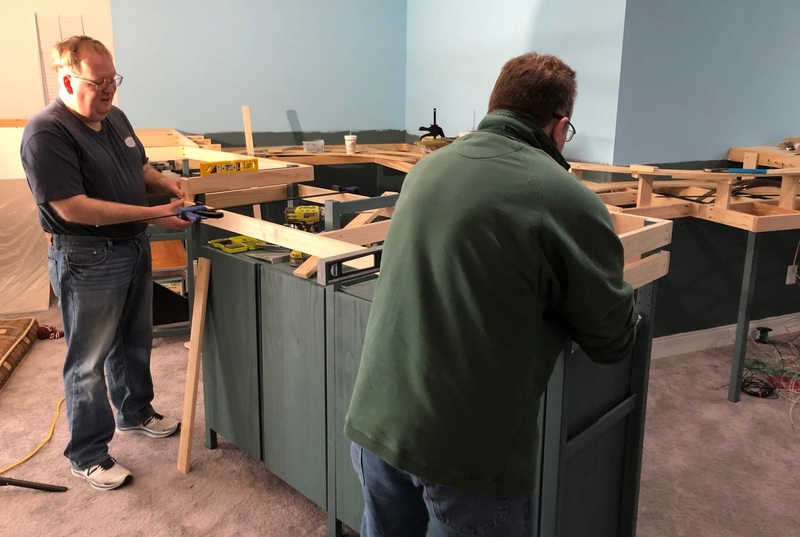 Even though we spend lots of time alone in the basement, we can share the hobby with a world wide fraternity through writing, blogs, joint work sessions, open houses, RPM meets, and the NMRA. 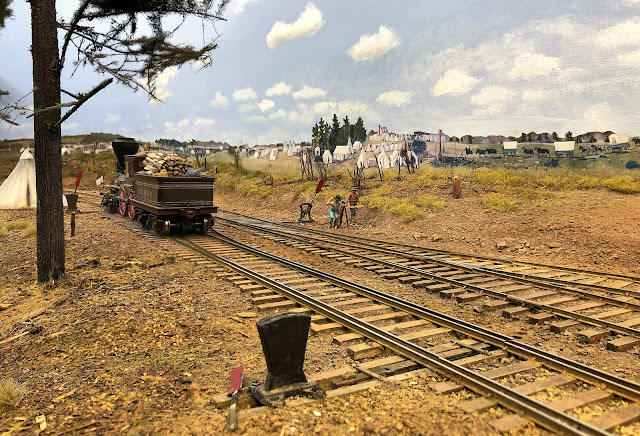 My wife is no longer amazed about how, regardless of where we travel, there is usually a fellow model railroader we can visit. By modeling a Civil War railroad I was able to combine my interest in military history with model railroading. I feel my civil war era railroad allowed me to opportunity to learn a lot about American political, technology, military, and economic history. At the same time, I was able to develop a somewhat unique railroad that also allows for fun operations. I also had a nagging feeling that some aspects of war-gaming trivialize combat, especially WWII. Many war-gamers are infatuated with German WWII weaponry, while ignoring the attendant horror. I studied WWII quite a bit in my high school and college days, but I didn't have much urge to wargame it. 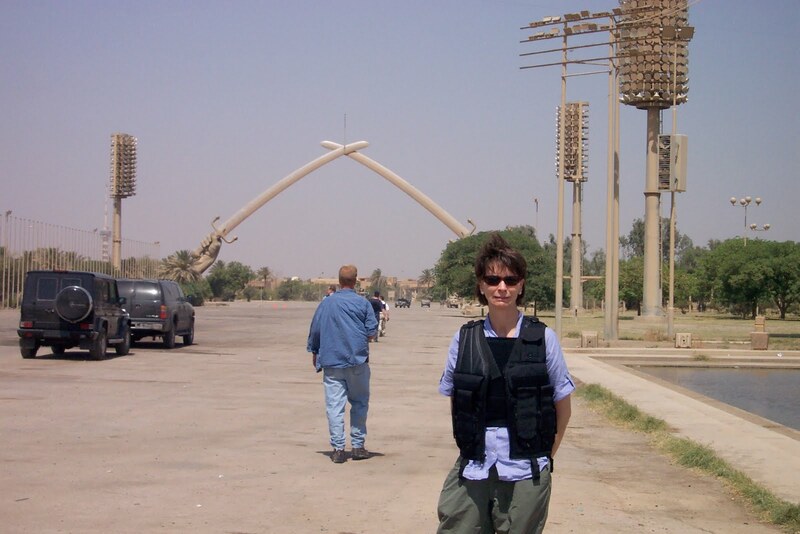 I used to say to folks, I lose interest in war-gaming with the advent of the machine gun and its wholesale slaughter. However, JD and Mark spoke highly of the WWII game system they were starting to play. It's called Bolt Action. It's a skirmish level game meaning that battles that are platoon to company size with individual soldiers and vehicles. I picked up the copy of the rules and it did appear that the game system captured the fire and movement of WWII tactics without too much complexity. Being a former Army officer, a realistic simulation of tactics is important if I am to appreciate a game or simulation. The Bolt Action system is oriented to using 28mm figures, which scale out to about 1:56. Somewhere between S and O scale. I should note that I have hundreds of 28mm civil war figures on my layout as forced perspective objects. But I was dubious that such large scale figures could work in a game, after all weapon could fire across the room if done to scale. Armored vehicles are primary targets in a situation like this. So I went into the game Friday with an open, but skeptical mind. Unfortunately, Mark had to cancel at the last minute, but JD and I went ahead. JD had created a nicely detailed terrain board with an interesting, freelanced scenario. The game system presented a lot of difficult decision making. It did reward sound tactics, but luck and some gamesmanship played a part too. Overall it was an enjoyable experience, and I would probably like to see how works in other scenarios too. The larger figures worked out well since the game focuses on infantry combat, with armor and artillery in support. Part of the enjoyment of the miniature war-gaming hobby is making an interesting, but functional terrain board. Some people care less about this and are happy to play over a plain table, but most others prefer a nicely detailed scene. I learned many of the scenery techniques I use today in model railroading from building war-gaming terrain. War-gaming terrain has to be tough as it gets handled a lot in the games. It should be reconfigurable as to allow use in multiple scenarios. However, I specialized in making detailed pieces for each battle. For example, I once made a detailed model of the Marshall House that was about 2 by 2 feet for use in a large wargame depicting the battle of Cedar Creek. Unfortunately, I never got any good photos of those terrain pieces. I do have some scenes from a Gettysburg game, see above. The Bolt Action game was a fun diversion. JD and Mark are good friends and any excuse to hang out with them is welcome. Mark commented to me, that he is glad he is getting into WWII gaming as it is causing him to go back and research things that he had forgotten or never knew. All of our parents participated in the war in some manner, so it is a way for us to think about their sacrifices in a pleasant setting. As JD says, "our soldiers don't bleed." Mike Spoor stopped by this afternoon to work on some projects for his new switching layout. His layout is based on an industrial switching district on the former Rock Island line in Houston Texas in the 1980s. First we weathered three boxcars. Mike doesn't have an airbrush, so we used mine. Of course, the airbrush was acting up because I had damaged the nozzle when I last used it. After swapping out the nozzle we were able to spray some basic rust and grime on the cars. Then we added some rust spots, scratches, streaks and other weathering using acrylics and brushes. Next we built some trees using Supertrees and some plastic styrene tubes. Mike's layout is set in the summer time. So he needs green trees. I have a lot of excess Supertrees so we used them to make a batch of deciduous trees. To thicken the trucks, we used 1/8th and 3/16th inch Evergreen tubing. To taper the trunks we used sandpaper and sanded gesso. Finally, Mike went to work on PoLA finishing up remaining work from the last op session, since I hadn't touched the cars in the interim. There was only about 20 minutes of work to do and he took care of it before dinner. At dinner, Mike told Alicia and I that he plans to switch to the Army reserve and stay in the Charlottesville area for a few more years as a private contractor. This is good news for us, as Mike is a good operator and a nice guy. He will continue to be a welcome addition to our ops group. Peter Clarke and Bob Rodriguez working the west end of Cortana yard. In the background is the operator, Bryan Kidd. If you ever met Pete LaGuardia, you would have no doubt about where he grew up. Pete has a thick New York, Bronx to be exact, accent. But behind that distinctive brogue is a delightful and generous man who has a wonderful model railroad. (see https://petelaguardia.wixsite.com/mysite). I had the opportunity to operate that railroad today. Pete, in his infinite wisdom and generosity, assigned to me the job of Cortana Yardmaster. He said, "I gave you that job because I thought you'd like it." Classic Pete, always thinking of his guests first. But would it be a decision he regretted? Now, Cortana is the main classification yard for his railroad. It requires two engine crews and a yard master to run. Without a smooth running yard, the railroad could grind to a halt. Putting it in the hands of a first time boomer who is also a notorious night bug, for an early morning op session might be a formula for disaster. So what happened? Let's take a step back and give a bit of background. Pete, as I mentioned above is a New York aficionado. His basement is decorated with all manner of New York artwork and memorabilia, including lots of New York Yankee souvenirs. Being a native New Yorker myself, actually a Brooklynite, and also a die hard Yankee fan, I fit right in. At one point as we compared notes, we discussed a native New York drink - the egg cream. The modern egg cream has neither eggs nor cream, but it was a delightful creamy chocolate flavored soda. It must be made fresh and consumed quickly. It doesn't bottle well, so it never really spread beyond New York. Political side note, the current doings in New York make me hesitant to publicize my New York heritage. The New York of my childhood of the 1950s was a nice place to grow up. Every neighborhood was like a small town. People knew each other and looked out for each other. Each neighborhood was typically a distinct ethnicity that developed organically. Neighborhoods ebbed and flowed as people came and went. Most people got along and enjoyed what each neighborhood offered. It was a diverse and mind expanding place to live. However, by the late 1960s misguided policies lead to serious problems. Many neighborhoods decayed to graffiti covered wastelands awash with drug abuse. A dangerous place to attend high school. So my parents decided to leave. Later, the city underwent an amazing renaissance under Giuliani. His approach was to start with small problems, like cleaning up graffiti, and push up. It worked. I did a bike ride across the five boroughs in early 2000 and was amazed at how nice the city had become. I hope it can stay that way, though the distant news coverage is not promising. Back to Pete's layout. Pete wanted to model the New York Central in the city with tall buildings and car floats. But, he also loved the Santa Fe Railroad. So he freelanced his railroad, naming many of the towns after his relatives. Being of Italian heritage, the towns sound like a line though Italy - Calamia, Alfano, Rinaldi, Cortana, etc. Great, now how to create an operating scheme that made sense? Enter Steve King. Steve is a legendary model railroad operations guru. For many years he actually worked as a dispatcher for a real railroad before becoming a consultant. Steve has written books on prototype and model railroads, especially, 19 East, Copy Three, which he cowrote with David Sprau. Steve helped Pete develop a realistic operating scheme for his freelanced railroad. One of the key decisions was to decide where to place the railroad geographically. They came up with The Western Illinois Division of the New York Central. It would operate from Kansas City, Omaha, and Des Moines on the west, through Moberly (MO) and Hannibal (MO), to Danville (IL) and Indianapolis (IN) on the east. The car float operations were notionally on the Mississippi River. So Pete had his big city and Santa Fe passenger trains. But Pete also had a confused yard master. While I am a student of geography, I had trouble figuring out where the various destinations were in relation to my assigned yard. Fortunately, Pete has provided excellent documentation both on the paperwork he emailed prior to the op sessions and on the layout to help boomers figure it all out. It took me a few minutes to digest all the info, including how to use the telephone to the operator. My yard crew, Pete Clarke (also a first timer on the Western Illinois Div) and Phil Raymond (a veteran on the layout) were very helpful in keeping things moving along. Mat Thompson, as the western staging yard master, and Bob Rodriguez, who ran several transfer runs into the yard, were also very helpful. The Cortana Yard is huge, with seven classification tracks, two arrival-departure tracks, and two through tracks. So we had plenty of room to do the switching work that making and breaking the trains required, even for the 24-car train maximum limit. All in all, it worked very well. Pete has some added touches, like an automated double slip switch and the aforementioned telephone system, that simplified a potentially complex operation. There were several through trains, transfer runs and trains that originated in the yard, including a long local. I never got to see much of the rest of the layout but about a dozen other operators were busy doing their tasks. All in all an impressive model railroad. After the session, Marie Ann, Pete's wife, provided a delicious lunch buffet of baked chicken, meatballs, and tortellini. When I got home, I hung a portrait of Abraham Lincoln on the wall over my dispatcher's desk. Even though my associates on the ACWRRHS forum thought that a painting of Lincoln would be rare in a dispatcher's office, my brother decided to paint one for me for my birthday (or should I say our birthday, as we are twins). So there it is. It looks good. He did a nice job on the painting.